Eastside Co is one of the world’s most trusted and experienced Shopify Plus Partners. Established in 2012 as a full-service digital agency, we’ve helped hundreds of aspirational brands exceed their goals thanks to our world-class ecommerce solutions. As one of the most experienced Shopify Partner agencies, ecommerce website development is what Eastside Co does best. We’re an international web design company, based in Birmingham, UK, with offices in London, New York City and Dubai. Having developed over 500 Shopify ecommerce stores in the last 5 years we have generated over $325 million for our clients. We are one of the world’s most trusted Shopify Partners, and with a growing portfolio of clients the world over, we understand ecommerce website development for international markets. Why did we choose Birmingham? We’re based in the heart of Birmingham’s creative quarter, overlooking Digbeth from our offices in the historic Custard Factory. Our central location means that it’s convenient for us to visit clients all over the UK as well as giving them the option to meet with us at Eastside HQ. Our portfolio of UK-wide clients is expanding quickly, with new web development clients being added all of the time. 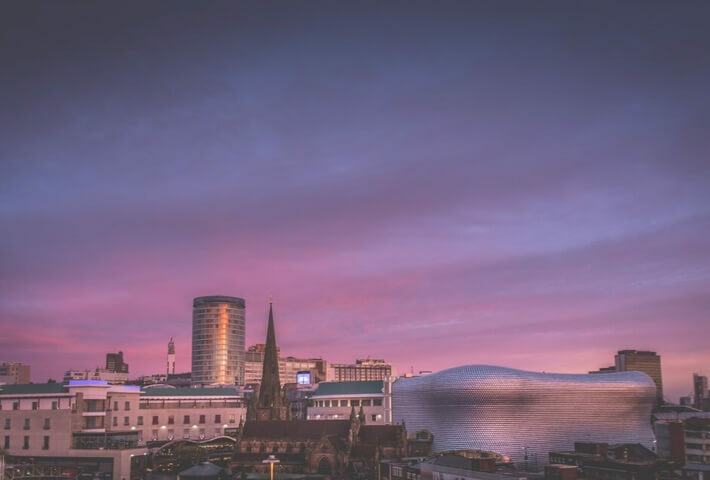 This is why we chose Birmingham as the home for our UK Shopify web design agency. It gives us perfect placement to offer our web design and ecommerce services to the rest of the United Kingdom. Being a digital agency in the Midlands and one of the top Shopify Partners means that we are trusted and accredited by the biggest name in ecommerce website design. We offer Shopify website design and digital marketing solutions for businesses of all sizes. Whether you’re looking for complete ecommerce website development for a new brand, want to migrate an online store onto the Shopify ecommerce platform, or you’re looking to grow an already existing online shop, we’ve got a dedicated team to help you. As the UK’s most trusted digital agency, we’re on top of every development in the ecommerce industry, from initial website design, project management, development, and user experience. We’re also experts in a range of marketing tactics including SEO, PPC, email marketing, social media marketing and data marketing. We create data and results driven marketing strategies to help drive our clients’ businesses forward. We also develop highly reviewed Shopify apps, working to streamline your Shopify store and innovate your customer experience. With a growing portfolio of UK and internationally-based clients, we understand ecommerce for global markets. Get in touch with us at our Birmingham office on 0121 794 0199.